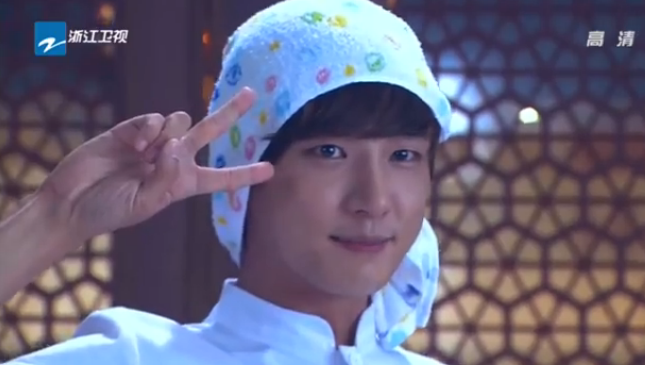 I’m love YSY and his facial expressions, he is truly a master at the puppy eyes, the outraged man, the happy go lucky – to say a few. He shines when everyone else kinda makes me yawn. Let me know what you think! Jiang Xiu Can is led to the kitchens and meets the chiefs. Tang Li Qin – Head Chef – His first words were learned from menus and has more than twenty years experience. He can tell you the 280 types and dishes using noodles repeated backwards and forwards. He commands respect from everyone in the kitchen. Dong Dong- Cutting Chief – Even though he looks young, he is so skilled that in 30 seconds he can cut 34 slices of potato so thin they can go through the eye of needle. Yang Wei – Flavor specialist – lived from youth in a garden. Can tell you where, when, and how fresh a vegetable is just by looking at it. Xu Heng – Noodle master – started when he was five and knows every way to make noodles, learned from all chefs since he was 15. 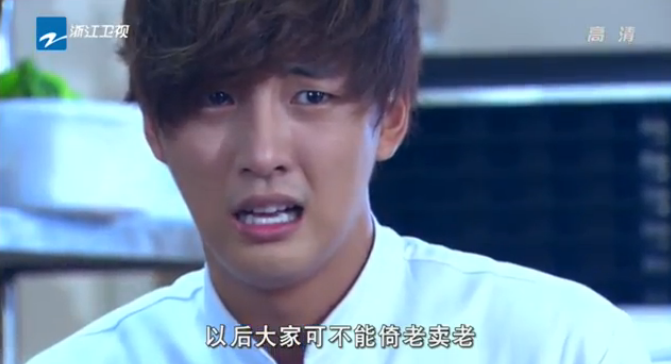 Ling Ling tells Jiang Xiu Can to introduce himself and he starts off very shyly and she tells him to raise his voice. He giggles and smiles to himself and shouts hello! I’m Jiang Xiu Can from Korea and I’m the dark horse competitor from the Noodle Competition.I will work hard to become the best! 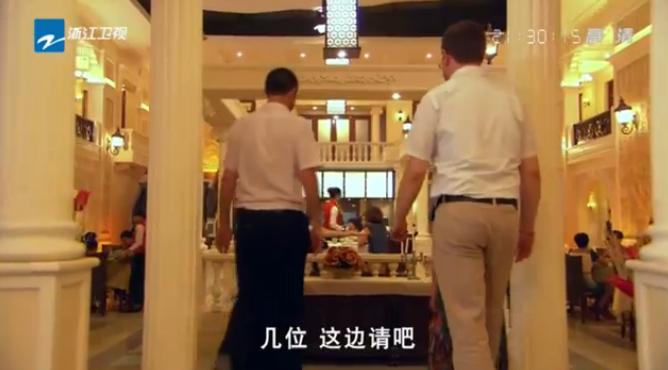 Dong Dong, Yang Wei and Xu Heng stare at him and mutter that they worked and used every trick they knew to get through the door, and he struts in so easily. And they decide to haze him. 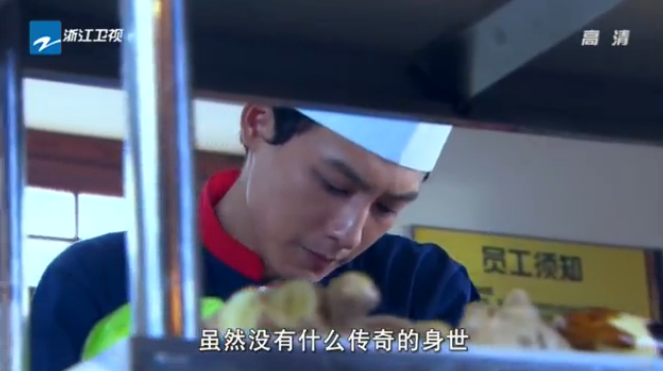 They pull Jiang Xiu Can to make noodles and he chokes on the flour dust, they make him chop onions right after and he cries, they tell him to grab some crabs and the crabs grab him. Jiang Xiu Can slips on the floor in confusion and the kitchen laughes at him. Even grandpa who just arrives chuckles at the rituatl hazing. Jiang Xiu Can points at them and asks how can they be so mean to him. Zhang Jian snaps at him that this is because he is such a newbie with no skill, that’s how he’s been tricked. Being nice will get you nowehere, the only thing that matters in the kitchen is skill. Grandpa shakes his head at his grandsons words. The head chef tells them to start work and it’s clear that the Noodle House is very prestigious They even have FOREIGNERS. Its unintentionally hilarious and I really don’t think asians dramas should use white people to try to say something is famous, just because white people are there (common business practice). Anyways, Zhang Jian is washing dishes and Ling Ling runs to tell him that he needs to come and take care of a situation. Xu Yu Ting has come and will not leave until the restuarnt bring her Zhang Jian. She buys alot of food and is being a general nuisuance. Zhang Jian takes one annoyed look and leaves, telling Ling Ling that she is the executive assistant, she needs to take care of this. 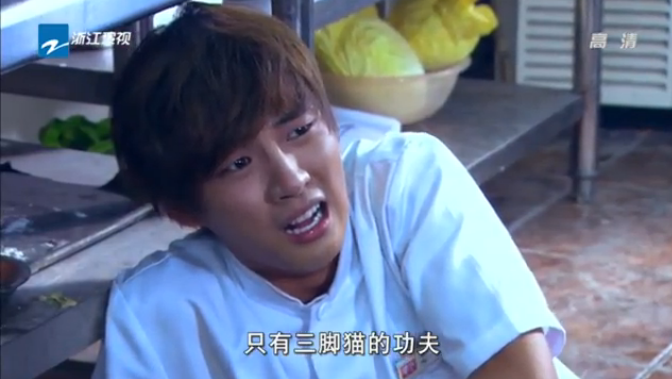 Mean while Xu Yu Ting has started breaking dishes and screams and yells at everyone. Teng Yuan Hao sees an add for Hangzhou Noodle house busboy positions for two people. He grabs the add and goes in to talk to one of the managers. She tells him that they need two and he tells her that as long as she has him, all she needs is one. She rolls his eyes and threatens to call the police. 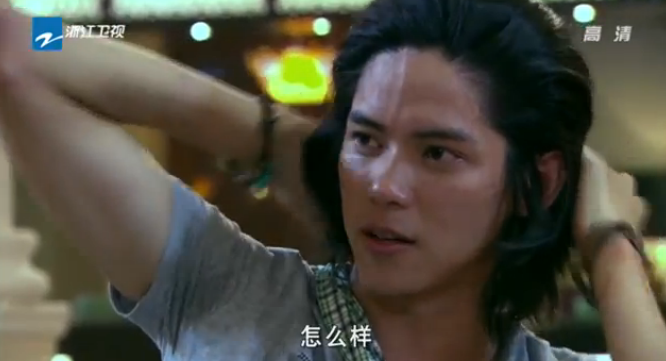 Teng Yuan Hao sees Xu Yu Ting causing a ruckus and tells the manager that he can get rid of her. 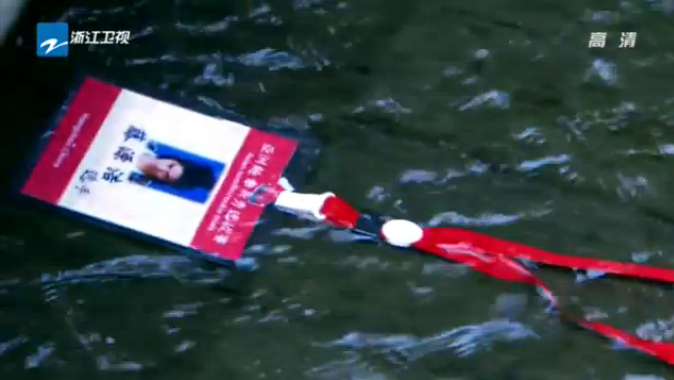 He recognizes Xu Yu Ting as the girl who caused him to lose his ID so that he couldn’t compete in the competition. He goes to her with his hair all crazy and acts like a raving lunatic. She gets scared out of her wits and runs away screaming at his antics. Once his show is over, he coolly pulls his hair back and is hired on the spot. Meanwhile, Daddy Zhang and his wife Wu Ren Mei are dicussing the developments at the Noodle House. 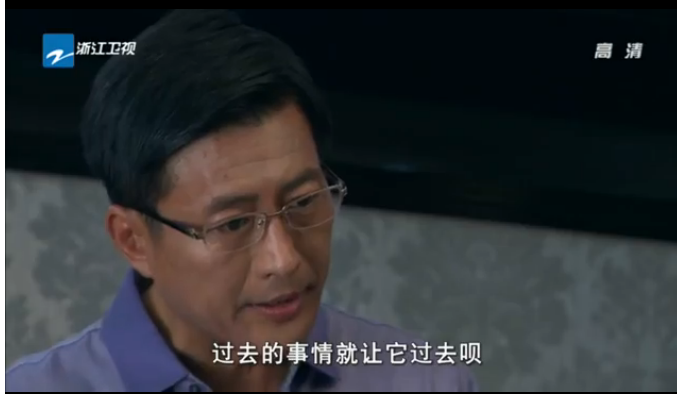 Daddy Zhang likes the hardworking korean, but Wu Ren Mei tells him she thinks he’s only acting. 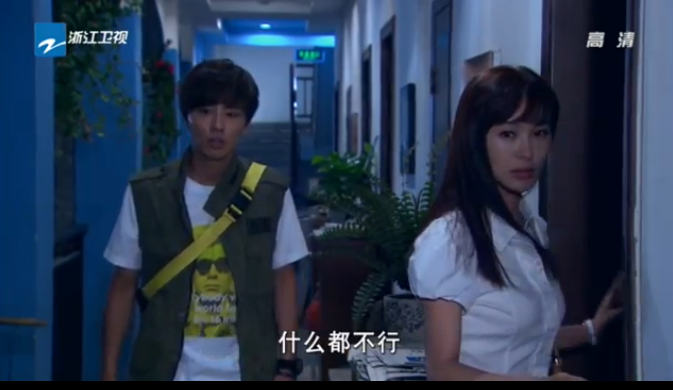 They are interrupted by the arrive of Zhang Mei, Zhang Jian’s little sister back from Milan. Zhang Mei is clearly Daddy Zhang’s favored daughter, but Zhang Mei is very very cold to Wu Ren Mei. Zhang Mei is snarky and asks if Wu Ren Mei’s skin is so bad lately because she’s been meddling too much in business, perhaps she should take a vacation. 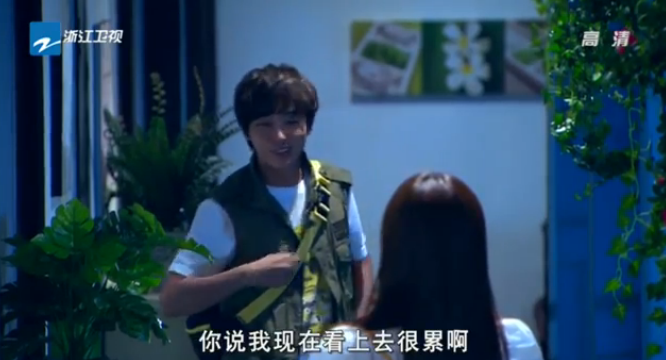 Meanwhile, Ling Ling shows Jiang Xiu Can to his new room, saying that he looks so tired for just the first day. Jiang Xiu Can says he can go and run right now if he wants to. She rolls her eyes and shows him his room, pushing his door open. He sees that there’s a bucket of water on top of the door and grabs her before it hits her. 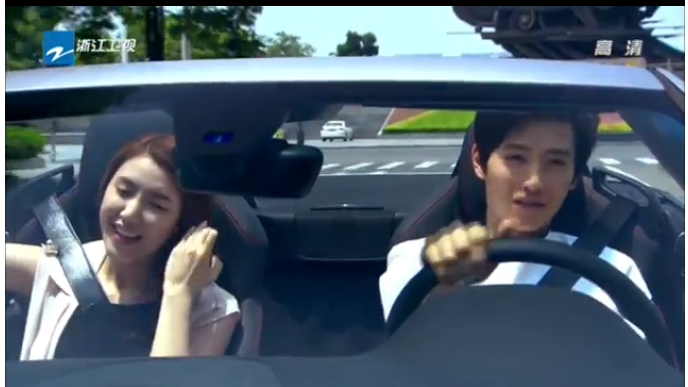 Of course, the drama-land must have “spin” and the main characters find themselves to be startlingly close together. They break apart and Ling Ling finds that his room is a mess. She goes to find Dong Dong to tell him that there’s been a burlgary only to overhear Dong Dong and the two guys loudly deride Jiang Xiu Can, messing up his room will definitely teach the talentless kid a lesson about working in the noodle house. 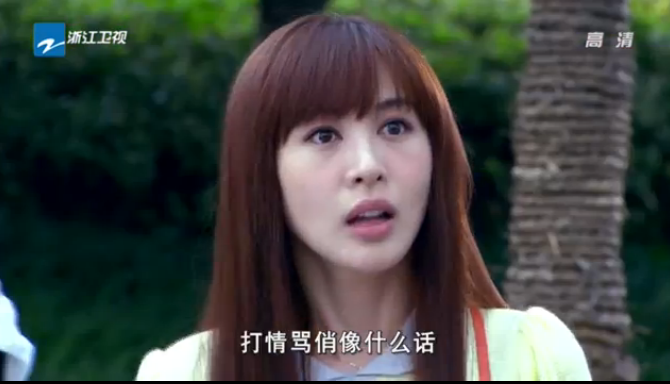 Enraged, she’s about to knock when Jiang Xiu Cai grabs her hand and shakes his head. 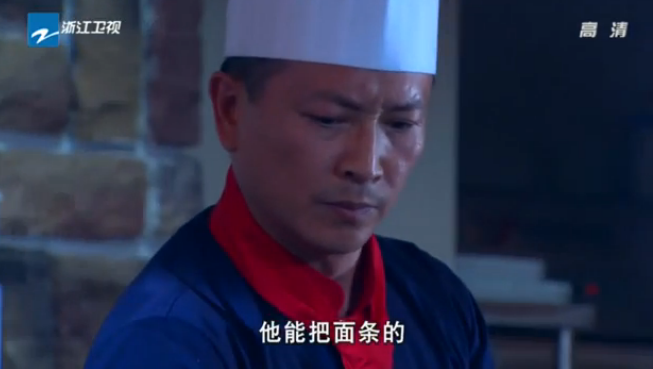 Jiang Xiu Can storms into the kitchen and starts grabbing knifes and rolling pins, looking very determined. 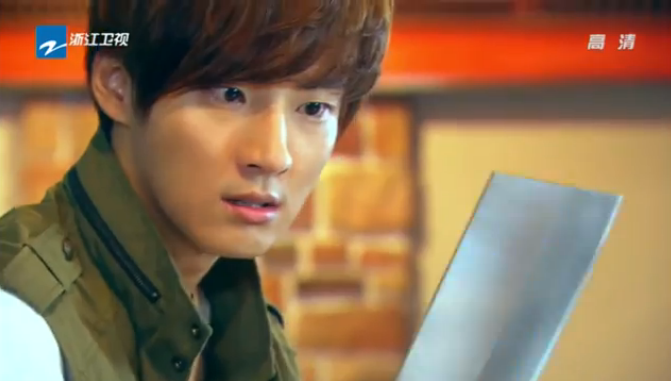 Ling Ling is startled at his serious mood and quickly moves to block him from the knives. She tells him that Dong Dong and the guys were just playing a joke and he shouldn’t do anything rash. Jiang xiu Can tells her to move. She shakes her head, he tells her again and she says no. Exasperatly he tells her that all he wants is the flour. She says no and realizes that he wasn’t going to go for revenge. Sheepishly, she moves aside and he tells her that they are right, he doesn’t have any skill, but he can practice. He’ll need some of his own equipment and materials, since she knows the area, can she go with him tomorrow to get the stuff? Ling Ling smiles and says, if she’s not busy she’ll let him know and leaves him to practice on his own. Back at the Zhang house, it seems that Zhang Mei’s animosity towards Wu Ren Mei doesn’t extend to Zhang Jian, whom she dotes on and gives a handstiched chef’s jacket. Zhang Jian explains that he’s just a dishwasher. She asks why he’s doing it and he tells her that he wants to work from the ground up. Zhang Mei tells him good for him, as long as they don’t allow that woman (Wu Ren Mei) to take over their lives, they’ll be just fine. Wu Ren Mei is listening at the door and later reminesces about the past. She has just given birth is trying to take her kid to an orphanage. Jang En Ying ( Jiang Xiu Can’s mom) tries to talk her out of doing it but Wu Ren Mei replies that if En Ying is not going to take her baby, she’s gonna leave it. En Ying tells her to act responsibly, En Ying is doing well, even if she is a single mother. Wu Ren Mei replies that the man she’s dating think she’s a virgin, how can she get married with a baby here already. She won’t be like En Ying, who is left with a baby and a broken promise from a man. En Ying takes Wu Ren Mei’s baby and leaves. Wu Ren Mei smiles satisfactorily and walks off. Back in the present, Wu Ren Mei sighs and Daddy Zhang asks what’s the matter, she says that she’s remembering something. Daddy Zhang tells her to not be sad over the past, whatever she’s thinking, she’s just too kind and sensitive that’s all. Jiang Xiu Can is out with Ling Ling after buying all the stuff he needs and he tells her that he’s going to be an amazing noodle chef. She says that he’s not very modest. He laughs and tells her to hop on his bike. 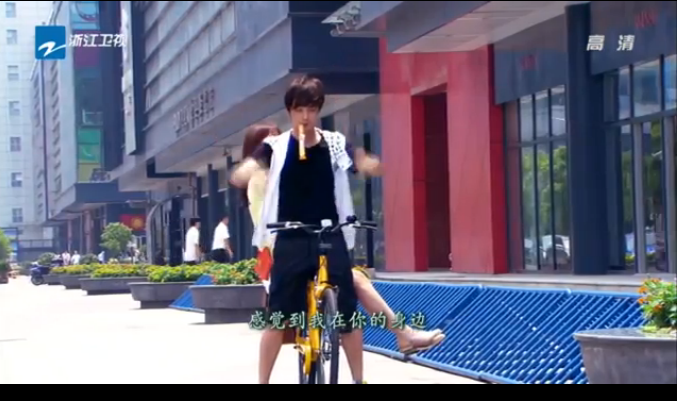 She says no and he literally walks/rides his bikes in circles and aegyo her into sitting on the back. He rides faster and she grabs hold of his waist. This is of course seen by Zhang Jian who is taking Zhang mei to the movies. 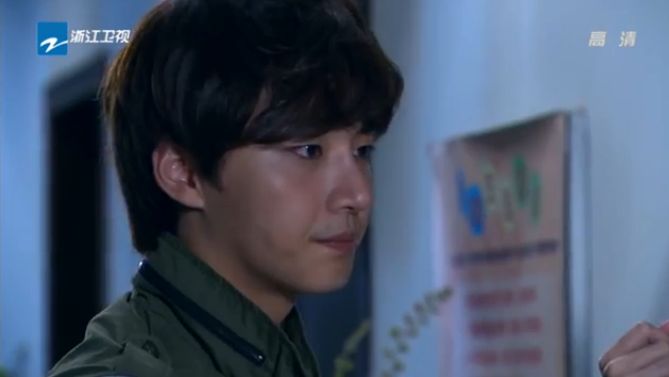 Zhang Jian is visibly affected by the scene. They stop at an intersection and Zhan Jian gets out to scoff at Ling Ling, asking how she can be so close and familiar with a kitchen drudge, doesn’t she have any propriety? She says that he’s misunderstood. 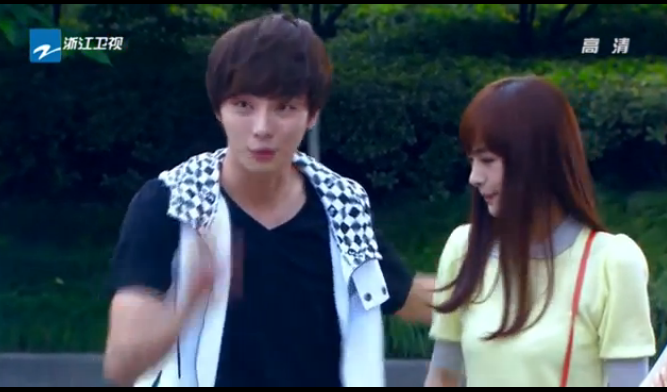 Jiang Xiu Cai tries to help and gets too close to Ling Ling and she swats his arm away. 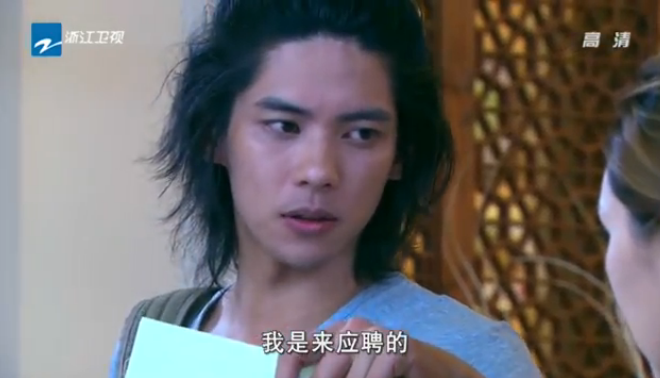 Zhang Mei teases and asks who the handsome boy is, is it Ling Ling’s boyfriend, Ling Ling looks shocked and denies it. Zhang Mei smiles at him and at her brother, who is clearly jealous. Jiang Xiu Cai doesn’t really get why everyone seems so upset. 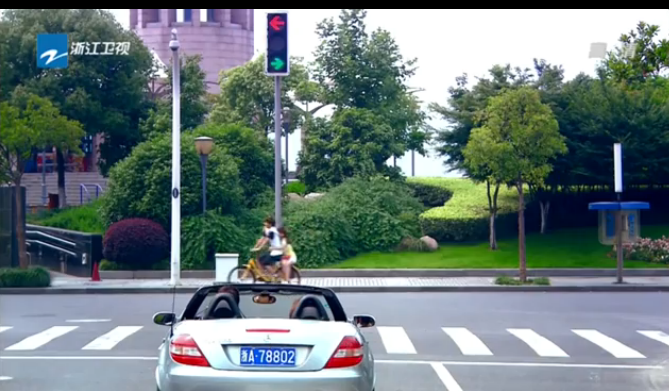 Ling Ling is upset and gets off Jiang Xiu Cai’s bike. He wonders what he did wrong again. 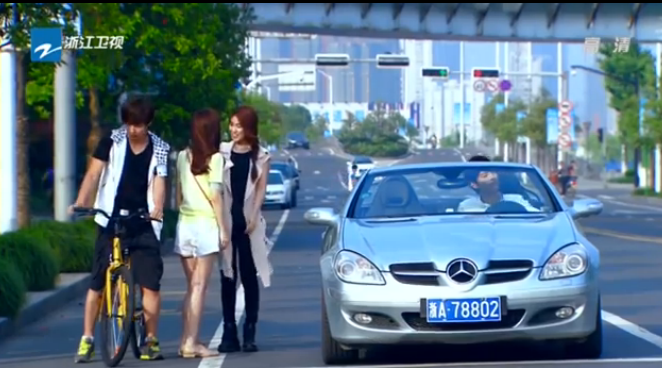 Zhang Jian rides off with his sister, not paying attention to the road and having to be reminded to pay attention. He tells her that he doesn’t feel well, can they go to the movies another day? Zhang Mei smiles knowingly.